Earlier this year, the House of Representatives approved of doubling the salaries of soldiers and police officers. Now, the Makabayan coalition along with The Alliance of Concerned Teachers (ACT) is proposing the House Bill 7196 hoping to have a minimum monthly salary of Php 30,000 for our government nurses this week. They will also file the House Bill 7197 requesting for the enlargement of minimum pay between Php 5000 to Php 16000 for the personnel in the government. To plead their request, they will organize a national coordinated protest happening on February 21. Other regions that will participate are from Cebu, Iloilo, Davao and Cordillera Administrative Region (CAR). According to Representative Carlos Zarate of Bayan Muna, the laws are a response for the insistent clamor of state workers and nurses because of the huge cost of living. These measures will also lessen the strong effect of Tax Reform Law and the massive increase of prices of our basic needs. Zarate then reiterated that this is the right time for the government workers’ paycheck to be adjusted as well. He is also hoping that the legislators will precipitate the approval of salary increase on how they prioritized the doubling if paychecks for the workers of Armed Forces of the Philippines (AFP) and Philippine National Police (PNP). 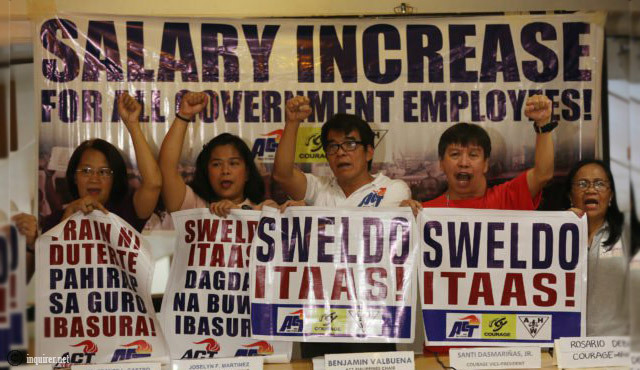 Meanwhile, Presidential Spokesperson Harry Roque stated that the government employees should not expect a salary increase before 2020. He explained that the teachers and other state workers are anticipating 2 more tranches of wage hike for the next 2 years under the Salary Standardization Law. He also said that the cabinet attests the President’s directive that they will look for ways to enlarge the salaries public school teachers and workers in the public sector but it will begin on 2020 not 2019. According to the Department of Education (DepEd), a Teacher 1 (salary Grade 11) is earning Php 19,620 while a Master Teacher IV (salary Grade 21) earns Php 47, 779.